I do not get many blues CDs from local bands, so it was cool to get Americana from The 44s, whose record company, Rip Cat Records, is in my hometown of Long Beach, California. But though this is a Southern California band they have a post-war Chicago sound, and they definitely exude a rough and raw old-school rock and blues vibe. You will notice on the cover of their CD that it says “with Special Guest Kid Ramos”, and this phrase says a lot about what to expect from The 44s sophomore release. Kid Ramos produced Americana and provided various supporting guitar parts for many of the tracks. He became a pro when he joined James Harman in 1980 as his guitarist, and he has since worked with the Fabulous Thunderbirds and Bobby Jones, and is a founding member of Los Fabulocos. But besides his guitar chops, he also brings a great ear to this project, and he is a fabulous producer. 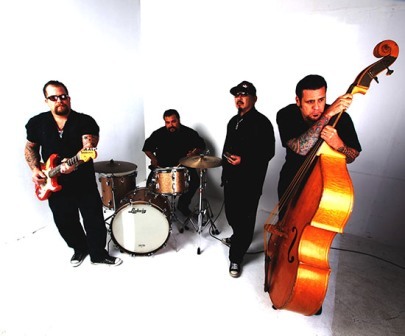 The 44s formed in 2007, and over the past five years have matured into their own sound. They gained a lot of momentum when their first album, Boogie Disease, was released last year. This earned them a lot of attention and provided them with the opportunity to play more than 200 shows all over the U.S. and win some new fans. By the way, Boogie Disease was also produced by Kid Ramos, and supposedly cost only $800 to make. 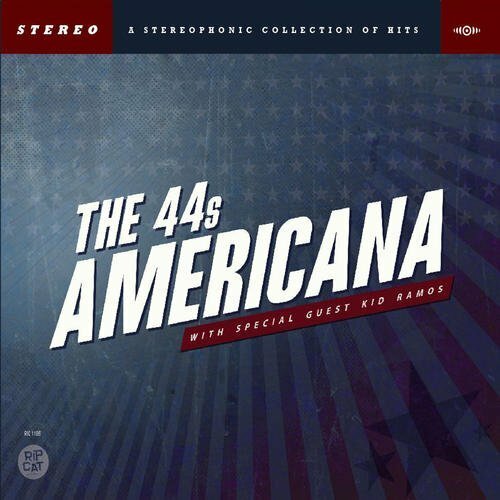 Americana is another step forward for The 44s, and with eleven original tracks and only two covers, there is plenty of new stuff to hear. The originals are well-written and cover the expected subjects of woman trouble and the consequences of poor life choices. The songs are played by a tight 4-piece group, with Johnny Main on vocals and guitar, Tex “The Weeping Willow” Nakamura on harmonica, Mike Turturro on bass and J.R. Lozano on the drums. And for good measure, Ron Dziubla appears on a few of the tracks with his saxophone. The album starts with “Hanging Tree”, which has some gloriously overdriven guitar and hard-played harmonica fashioned into a hard-driving boogie. If you have not heard Main’s voice before you will be pleased with its gritty and mature texture, and you cannot help but love the Little Walter that is coming out of Nakamura’s harp. This was a great track to start with, and it sets the mood for the coarse sounding (in a good way) blues that defines The 44s sound. On the second track, “Lady Luck”, Ron Dziubla adds his horns into the mix, and his tasteful contributions made me wish that he had more of a presence on this album. This track is full of rich reverb-soaked guitars, which are a great counterpoint to the saxophone parts. “Cocaine” is pure Chicago blues right out of the box, with plenty of squeaky and warbly harmonica and an uptempto driving guitar riff. Turtorro and Lozano work well together to keep the groove moving on this one, and the drums part are not just your usual high hat and kick drum. The plentiful fun drum fills help make this a super-entertaining song. The two covers are wisely-chosen: Willie Dixon’s “You’ll Be Mine” and Howlin’ Wolf’s “Mr. Highway Man”. These are both good times rocking tunes, and I hope they include these in their live set, as I plan to see them at the upcoming 4th of July festival that Rip Cat Records is putting on in Long Beach. My favorite track on Americana is “Hard Times”, which is one of the slower and more bare bones parts of the album, because it takes the blues back to its roots. It is mostly acoustic guitar and harmonica, along with some light drum work. Main provides soulful lyrics, and he and Ramos trade some licks and have some fun guitar interplay towards the end of the track. Americana shows that The 44s first album was no fluke, and proves that they are one of the most potent blues bands in Southern California. I hear something new every time I listen to it, and highly recommend that you get a copy of this CD (or download it from iTunes or Amazon) at your earliest convenience. Why do I need a DI box for my bass?